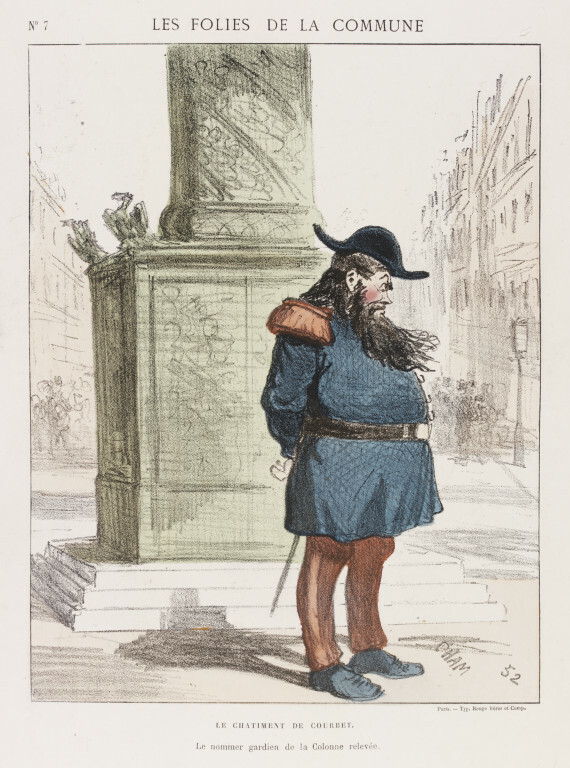 Print in which Gustave Courbet stands next to the Vendôme Column, wearing uniform, his hands behind his back. Print from a set of caricatures, broadsheets and illustrations in ten volumes. Each volume is half-bound in red leather, gold tooled and stamped with imperial emblems, title etc. First published in Le Charivari on 27 June 1871. 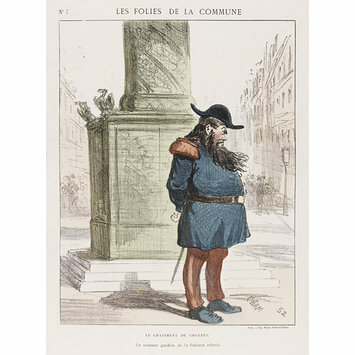 Republished in the state reproduced as plate 7 from a series of 20 entitled LES FOLIES DE LA COMMUNE. As early as September 1870, the French painter Gustave Courbet had urged the demolition of the Vendôme Column on the grounds that it was a symbol of Bonapartism and that it offended his artistic sensibilities. On 12 April 1871, the Commune authorized its destruction, which was carried out with great celebrations on 16 May. After the war Courbet, who was elected to the Commune at the April by-elections, was sentenced to six months' imprisonment and ordered to pay an enormous fine towards the column's reconstruction. To avoid finding the sum he fled to Switzerland. 'Le Chatiment De Courbet'. Satirical illustration by Amédée-Charles-Henry de Noé (Cham) in which Gustave Courbet stands next to the Vendôme Column. Hand-coloured lithograph, France, 1870-1871.